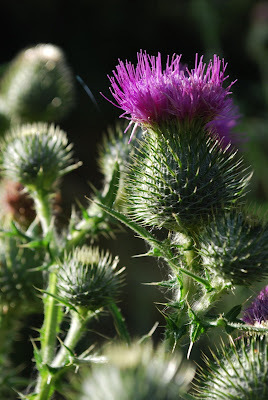 After all this I remembered I had taken picture of some thistles last year on a camping trip. I had a reference, but didn't use it. I just remember how the soft and radiant flowery purple top glistened with dew. Now I see the thorny base is taller. I will probably do a quick sketch of thistles with a longer base. Somehow my memories of thistles in the early morning sun translated to these dancing thistles with longer flowery crowns reaching for the sun. I love the pot and the radiant flowery purple thistles! Isn't that how art goes, we see something and are inspired and then we make it or paint it and it becomes what it wants or what our mind's eye saw. Have you ever seen an artichoke blossom? You'd love those. Laura---Thank you! I almost didn't cut the scallop top. Now I am glad I did. sapphire---I get a kick out of the fact that thistles are considered invasive, but they are so beautiful and strong. occasionally the Flower Market in San Francisco have flowering stalks. They are incredible!